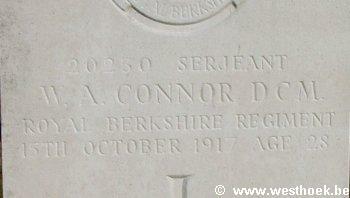 Serjeant W A CONNOR DCM 20230 2nd Bn., Royal Berkshire Regiment who died on Monday 15 October 1917. Age 28. Croix de Guerre (France). 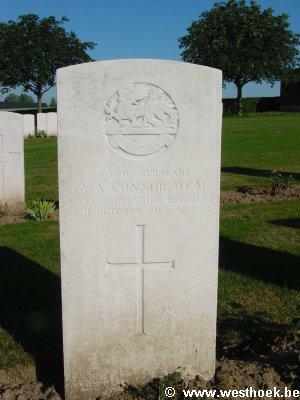 Husband of Maude Everett (formerly Connor), of Downham Rd., West Dereham, Stoke Ferry, Norfolk. Native of Tottenham, London. PROWSE POINT MILITARY CEMETERY Comines-Warneton, Hainaut, Belgium Grave : III. B. 7.